I’ve mentioned before that I’ve been through the arduous process of selling most of my Transformers collection. It wasn’t an easy decision. The truth is that I wasn’t really enjoying collecting the toys any more. Most of what I owned were either just sitting in storage boxes or were hidden from view. I just didn’t have the space to display what I owned properly. That, combined with the rising cost of keeping up with my growing video games collection and something had to give. I made the difficult decision to sell all but a handful of my Transformers, keeping just my DVDs, UK comics and a couple of select toys. Those fortunate to remain included one of my all time favourites – Disney Label Buzz Lightyear. The Disney Label series of toys was something of an unknown for Takara. On paper it seemed as if it were destined for failure. Surely a toy range merging Transformers and Disney characters was a disaster waiting to happen? Launched in 2009, the eight figure set was part of a wider range of toys that branched out from the then typical robot-to-vehicle ranges and instead had ranges covering music devices, working gadgets and the aforementioned Disney tie-ins. When the range launched with the Mickey Mouse / Optimus Prime hybrid I have to be honest and say that I thought I’d have more luck winning it big at https://www.bestcasinositesonline.com/ than this toy would have of being a success. How wrong I was. Takara weren’t the first to dabble in crossovers though. Hasbro beat them to it by several years with the equally bizarre Star Wars Transformers. These were joined a few years later by the short-lived Marvel Transformers. Ironically, as Disney now own both Star Wars AND Marvel the Transformers tie-ins all these crossovers ultimately came back to the same license holder! But what of the hero of Pixar’s Toy Story himself? The point of this piece in the first place? While I had originally thought the Mickey Mouse and Donald Duck toys in the Disney Label range were quite innovative, they didn’t quite appeal to me. I wasn’t a huge fan of the classic Disney characters so I felt somewhat indifferent to these two. It was the same with all of the variant designs and colour schemes. Then Buzz Lightyear was unveiled. Toy Story – well any movie by Pixar – was always going to be a win for me – and when I saw photos I just knew I wanted it. 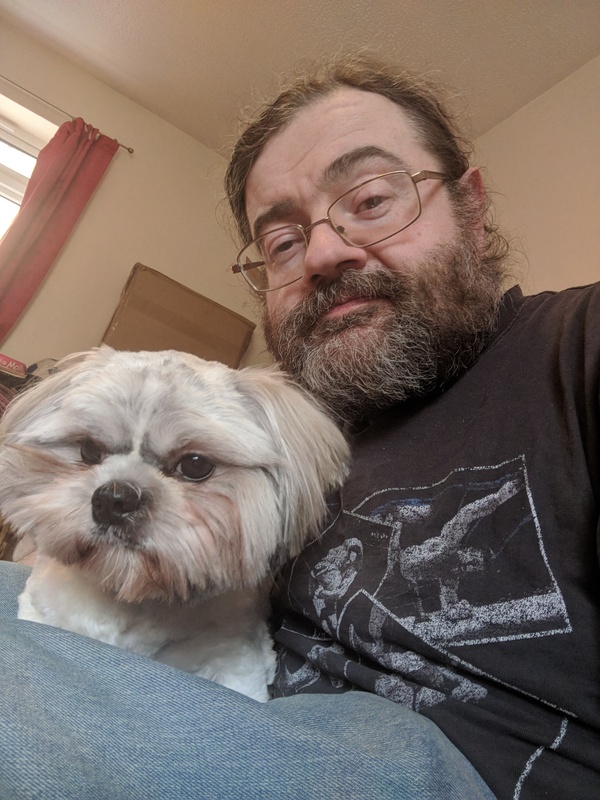 Getting one. Now that was the hard part. 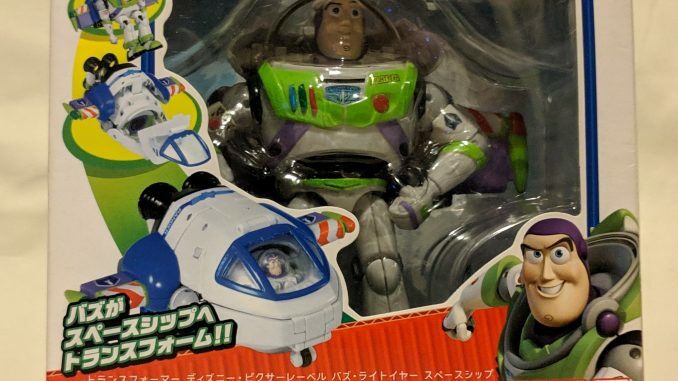 Being a Japanese exclusive toy made Buzz Lightyear hard to track down. The real problem was that he sold out very quickly. As such when traders did have stocks prices soon increased to meet the high demand from fans. When they were available on the market, it was a lot higher than the original Japanese RRP. At one stage I doubted that I’d get my hands on one without the help of a win at sports betting canada! Eventually I was successful in I can’t remember how much I paid for him now, but I do know that it cost a lot more than a toy of its size should have. But was it worth it? The first thing you notice is the packaging. Being a Takara release makes the toy a little more environmentally friendly. There are no twisty ties here – just the toy in it’s box with great artwork, a clear window on the front and top. 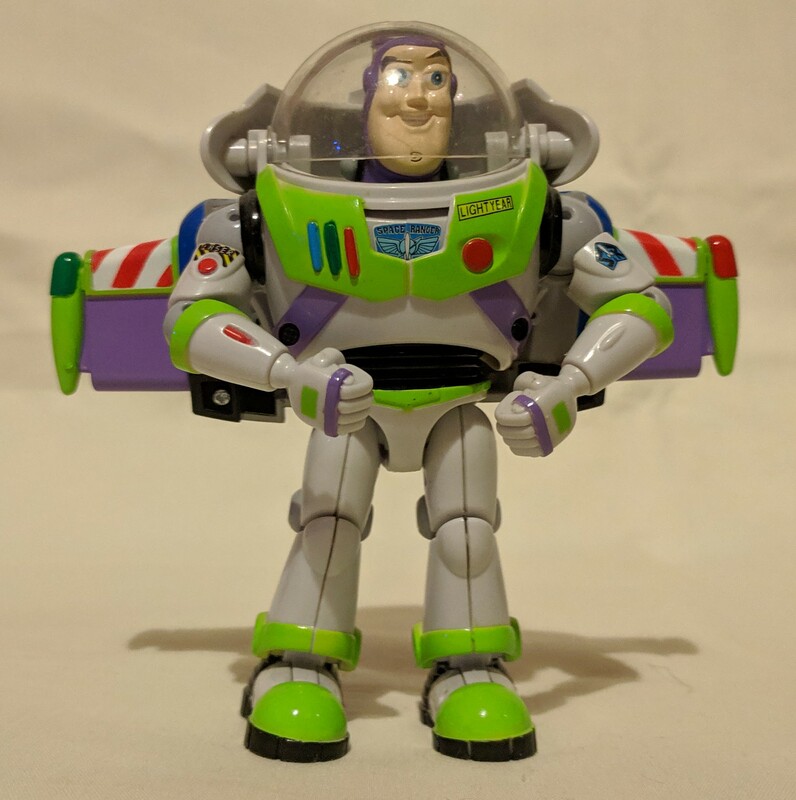 Buzz Lightyear himself is held in place in a plastic moulding that can be easily prised open. Most importantly for collectors who like to keep their toys in pristine condition is that once opened, the figure can be put back in the box at any time and still look brand new. Onto the figure itself though. In total, Buzz stands at 4.5″ tall and is an incredibly detailed, colourful figure. Considering his relatively short stature, he is quite well articulated with moveable shoulder, elbow, and wrists for the arms, and hip, knee and ankle joints for the legs. There’s no head movement (although I’ll explain this later) but the visor to his suit’s helmet can be opened. As you would hope, the wings to his suit can also extend which was a great touch too. I mention the head a moment ago for a very specific reason. 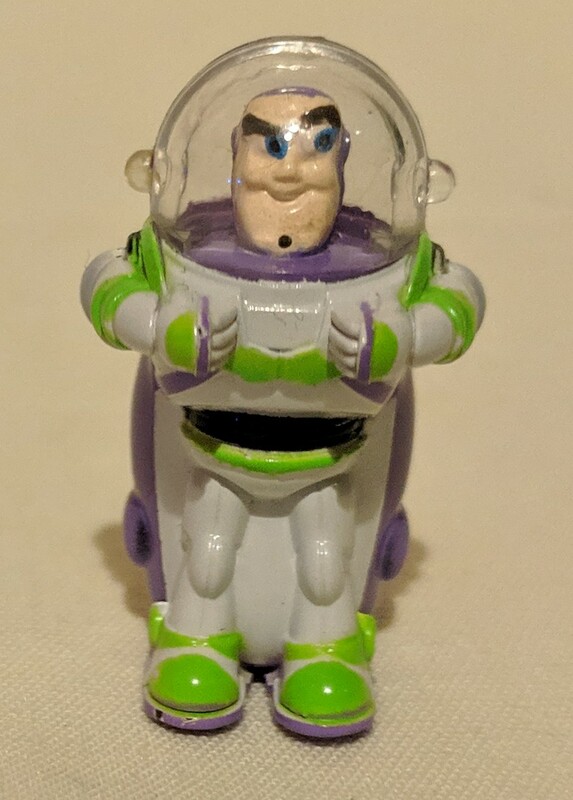 When Buzz Lightyear is in this mode you can see his head inside his suit as normal but when it comes to transforming him you have to remove his head. At this point, you see one of the toy’s first real surprises. Because the head is infact a mini Buzz Lightyear figure that stands at just over an inch tall! This figure becomes the Buzz that takes the seat in the cockpit of the ship once you transform the toy into vehicle mode. It’s only a small detail but I felt that it was a great touch and really added something to the figure. Takara could have so easily taken the easy option and hard moulded both versions into the toy but chose to do this instead. And the figure is all the better for it. Transforming the toy is relatively simple and can be done in just a handful of steps. But don’t let that ease of transformation deceive you. What you are left with is a superb vehicle mode that looks exactly like Buzz Lightyear’s ship from the first Toy Story movie, just in miniature form. The cockpit of the ship opens to hold the mini figure revealed earlier, and there’s little indication that the ship has any elements of the Buzz figure until you lift it up and then his chest and arms become visible. One nice touch is that the back of his knees and the underside of the cockpit feature small wheels which, once transformed, allow the toy to be pushed along any smooth surface. While this won’t really matter to most adult collectors, it’s a nice addition for the younger fans and gives the toy extra “play” factor. It’s easy to see why this toy was so popular. Taking a fan favourite character from one of the most popular animated movies in modern times and then turning it into a great looking toy was a fantastic starting point. First up it’s well made, highly detailed and would sit well in a collection just for fans of Toy Story alone. But then adding an equally superb second mode just made it even better. And to top it all off Takara made the transformation simple yet fun. 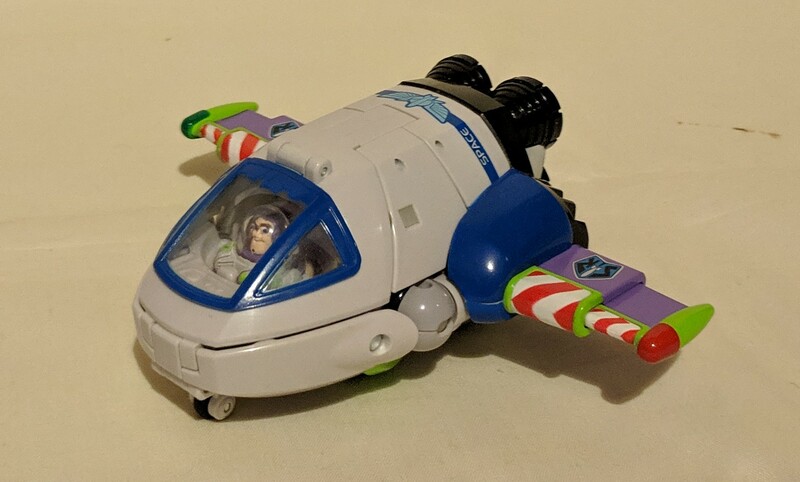 There really wasn’t anything they could do to make this toy any better short of adding electronics to it to give it lights and sound replicating the original full size Buzz Lightyear toy. As it stands, this is one of the all time great Transformers. It’s just a shame that it didn’t get a wider release outside of Japan.